Virginia boasts a variety of attractions to traveling families. Whether you're visiting Virginia for its historical sites, or just to get away, there are three indoor water parks you can enjoy in different parts of the state. The Great Wolf Lodge in Williamsburg, Virginia is ideally located for guests to enjoy the area's deep historical roots and the Busch Gardens theme park while still indulging in splashtastic fun. As with other Great Wolfe Lodge properties, it is a full resort, offering numerous amenities in addition to the indoor water park. The majority of TripAdvisor reviewers rate Great Wolf Lodge Williamsburg as either excellent or very good - one even describes it as "the best stay ever." An Our-Kids.com review echoes this sentiment, stating that the resort "it is dedicated to fulfilling the amusement of every child," all centered around the indoor water park as a focal point. The resort's indoor water park, Bear Track Landing, offers liquid fun to the tune of 300,000 gallons of water in a huge facility. 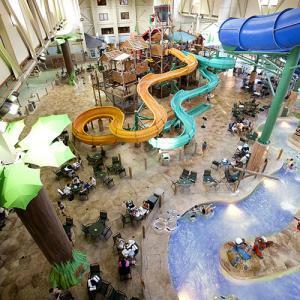 The Our-Kids.com review describes the resort's indoor water park as "an amazing attraction for families and kids of all ages." One Yelp reviewer says the water park is "clean, definitely warm, and most of all, safe" and others brag about the quality of the food and water attractions. As if that isn't entertainment enough, guests can also enjoy an eight-minute show from the elaborate animated clock tower in the main lobby, complete with a forest theme to coordinate with the resort's rustic décor. Massanutten Resort is an all-season resort located ten miles east of Harrisonburg in the Shenandoah Valley of western Virginia. 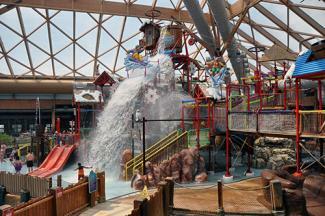 Its indoor water park was named as one of the ten top indoor water parks in the U.S. by Budget Travel and USA Today. It is a full resort, with on-site accommodations and many amenities. TravelingMom.com describes Massanutten Resort as "Virginia's Answer to family-friendly." Some outdoor water features are also available seasonally. These include a wave pool, large activity pool, and a mat racer slide. Resort guests can enjoy numerous additional outdoor activities at different times of the year, including skiing and snowboarding, mountain biking, fishing, golf, and more. Resort amenities include numerous dining venues and gift shops, such as a Teddy Bear Factory and other souvenir stores. Both hotel and timeshare condominium accommodations are available. On TravelPod.com, one reviewer who has owned a timeshare at the resort for over 25 years says that it "just gets better with age." Located in Chantilly, Virginia, the Cub Run RECenter is part of the Fairfax County Park Authority and is located about 30 minutes from the District of Columbia. It's not part of a resort but it's a wonderful spot to enjoy a splashing good time in the Washington, D.C. area. The facility itself is 65,000 square feet and a good bit of it is dedicated to water-based fun. Our-Kids.com describes it as being "great for families." All water activities are overseen by licensed lifeguards and swimming lessons are available. One Yelp reviewer says she has been very pleased with the quality of swim lessons and the attentiveness of the lifeguards. The facility also has a fitness center and two multi-purpose rooms that can be rented for events, such as for birthday parties or family reunions. On her blog, the Meanest Momma says great things about hosting kids' birthday parties here. She felt the price was fair and that the kids had plenty of pool time as well as time in the party room. She states, "I couldn't be happier with how it turned out." 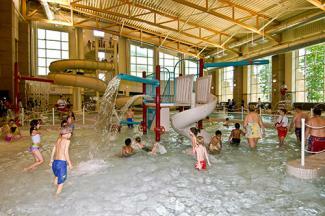 If you want to enjoy some indoor water fun in the state of Virginia, add one - or all! - of these fun destinations to your itinerary. Any of these facilities provides a great way to relax and unwind while having some wet and wild fun in a climate controlled environment.